Masterpress is a trusted producer of high-quality shrink sleeves and self-adhesive labels which can be seen throughout Europe. As a standard service, our team provides comprehensive technological advice in terms of packaging design, development of your graphic designs, and the application of labels in the production lines. Each label request is reviewed, individually customized, and are adjusted performance demands of the application lines. By combining different printing technologies through hybrid printing, Masterpress is able to achieve desired print quality and label appearance. Masterpress is a value-based company. Our core values are honesty and respect towards people and their work, treating our customers and employees subjectively. We assure mutual respect, build partner relations with our clients, and create a positive and friendly ambience. Simply stated, our clients and suppliers are our partners in business. 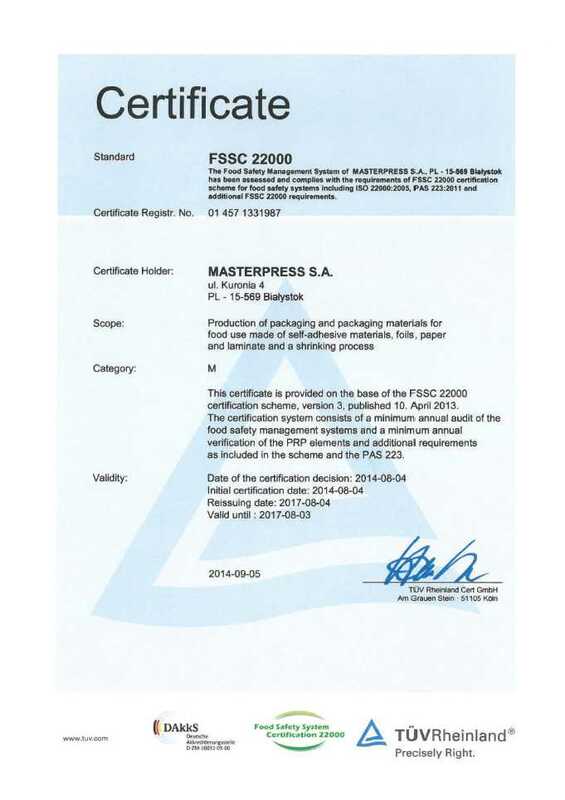 Masterpress is certified with the Food Safety System Certification FSSC 22 000 + PAS 223. All of our employees are committed to and comply with our internal Quality Policy and quality goals. Our Quality Assurance Department constantly teaches control awareness to our staff, which is assurance towards receiving a good product. 3 Images: FSSC 22000 and DPG and Quality Policy. Masterpress was presented two prestigious FINAT label awards in 2014 for the Heineken – The Future (limited edition) shrink sleeve label. The shrink sleeve was awarded as the Category Award winner (Non-Adhesive – Sleeves) and the Group Award winner (Non-adhesive application). The Masterpress produced shrink sleeve label for Żubrowka Special Edition vodka (French edition), was awarded for being a finalist of the prestigious World Beverage Innovation Awards 2014. The Żubrowka Special Edition shrink sleeve competed in the category of“Best Packaging Design or Label”was the only Polish product which was selected as a finalist of 2014 contest. Masterpress received the “Pearl of Packaging” award for the Desperados – Limited Edition shrink sleeve label in the Flexo Packaging category. All winning shrink sleeve were printed on one of Masterpress’ hybrid printing presses which combine both UV Flexo and rotogravure print processes on a single press.